Evidence given by Mr Sam Younger, Chairman, The Electoral Commission, and Malcolm Dumper, Democratic Services Manager, The Association of Electoral Administrators; Bill Crawford, Sunderland (NE region) Borough Council Electoral Administrator, Roger Morris, Chief Executive and Town Clerk, East Midlands Regional Returning Officer, Christine Mason, Electoral Services Manager, Wakefield (Yorkshire & the Humber) Metropolitan Council Electoral Administrator, John Pitt, Corporate Director (Resources), Wakefield (Yorkshire & the Humber) Metropolitan Council Returning Officer; Cllr Sir Jeremy Beecham, Chairman, Local Government Association, Michael Green, Policy Officer, and Tim Ricketts, Legal Team Leader, National Association of Local Councils (NALC). Q14 Mr. David Clelland: Even under the old system the way people vote is a secret ballot. It is not a secret that they do vote, because they are physically walking in and out of the polling station. I have never had a problem so far as I am aware, in my experience of elections, with people saying they are going to vote, so why should there be concern with people knowing that they have voted? Mr Dumper: The marked register at the moment is only available after the voting has finished. The marked register is available to anybody who requests it at the conclusion of the poll and after. The difference here is that you are providing data before the poll closes, and, although it could be overcome through a proper voter-education process, I believe there is a suspicion amongst the electorate that, if somebody knows you have not voted, they may know how you have voted. Clearly that is not the case but I can quite honestly say that during election day probably the biggest source of complaint or inquiry I have in my office is from people asking why their electoral number is written on the ballot paper counterfoil, because their vote could be traced, and the fact that, if we did provide information that they have not voted before, there is a suspicion that the vote could be traced. Q15 Mr. David Clelland: Obviously the arrangements for these pilots are going to take some time to put in place, particularly in those areas that have not had pilots before. Does it give you any concern at all that the legislation is not yet before Parliament? Mr Dumper: Yes. I think it is a problem. Q16 Mr. David Clelland: It is going to cause a problem, you think. Q17 Mr. David Clelland: Is there evidence that it is causing a problem at the moment? Mr Dumper: I think the biggest significant issue where pilot schemes have taken place - not just postal but electronic as well - is where people are happy with that process, they see it more convenient, but then may have to return to traditional voting methods. That is more the case in those authorities that have conducted electronic pilots, where people have found that very convenient and modern but then have to return to a traditional voting method at the next parliamentary election. Q18 Mr. David Clelland: That was going to be my next question. Do you think that is going to be a problem as well, with people having one system of voting in these elections and then, come the next general election, perhaps having to go back to the polling booth. Mr Dumper: Absolutely. I could quote Alan Winchcombe, the Deputy Returning Officer at Swindon - an authority which is very proactive in piloting electronic voting, and, indeed postal voting. Alan, I believe, undertook several pilots in the last two or three years and he has already had that criticism from a number of his electors and a number of the locally elected politicians, that voters who are going to have to return to the traditional voting methods do not like that and consequently will not vote unless they can continue to vote in the pilot status voting methods that were trawled out in the last two years. Mr Younger: I would absolutely go along with that. It is very striking from those particularly who have undertaken all-postal voting, particularly over a sustained period, that they are very worried about the implications of going back to other methods. I have to say that I think, in a sense, that is in the nature of the beast when you are in a period where you are experimenting and looking at different methods. In an ideal world, we would take what we have learned from the pilots, roll out the underpinning legislative framework that you need and then roll it out; but life is not as simple as that, and we recognise it but nevertheless it is important that we do so. Malcolm mentioned Swindon and one might also mention Stevenage, where they have done all-postal voting - in fact I think they first did it in 2000 - and of course they are not in a region which anyone has suggested seriously for piloting, and there is a real practical problem there of going back to old methods. I have one more bit of detail on the question that arose about the marked register which is from our report on the pilots last year. We did have a small number of complaints that came to the Commission on the provision of the marked register to candidates before the close of poll. In focus groups conducted for the Commission - and this always has the health warning of how it is suggested - MORI asked participants for their views on whether political parties should have access to the marked electoral register before the close of poll, and MORI report that most people are instinctively against giving marked registers to political parties. Even if people do not mind personally, opposition remains. That is as far as it goes at the moment and that is what I think we need to investigate further before coming to a conclusion. Q19 Mr. David Clelland: All of this is designed to combat the problem of diminishing turnout and encourage more people to vote. Could that not be tackled simply by having a system of compulsory voting? Mr Younger: My own view - but again this is not a formal Commission position - is that compulsory voting would tell us that people are being compelled to vote, not necessarily that they are engaged in the act of voting or engaged in the issues, and I would rather be in a position of persuading people that it is worth turning out to vote rather than compelling them to do so. It is in that context that I think all-postal voting is something that is worth rolling out, so long as we can effectively address the security issues concerned, because the record shows - and this is very much evidence based - that it does have a benefit in turnout and also attitudes to it are fairly positive. One figure I came across which I was quite struck by because it goes back beyond the period when we have had, as it were, very significant piloting, was in some work MORI did for us in the 2001 general election - and this was when postal voting on demand was available but there had been very little all-postal voting. Fifty-three per cent in the survey they did said other methods should replace the polling station, and that was a view very much weighted to the younger end of the spectrum in terms of voters; 34 per cent were against it, and that was very much weighted to older people. Part of what that says to me is that we are in danger, if we do not look at adapting the system, of having a system that may still be just about all right now, but if you look at the way lifestyles and people develop is not necessarily going to be appropriate in the coming years. Q20 Mr. David Clelland: Presumably you have studied those countries that do have compulsory voting. Mr Younger: It has been on our agenda but it has not been one of the top priorities up to now because there have been other priorities. We are looking to undertake some research on the experience of compulsory voting in other countries. Quite apart from a general view, which is a general prejudice I have which I expressed a moment ago, I think the one experience that is probably closest to ours or the nation which is closest to ours is Australia, which has had compulsory voting for many years. I do remember talking to my counterpart in Australia who said, "It works in Australia largely because it has been there for 100 years and was brought in at a time when you had the kind of deferential society that was prepared to accept it." He said, "Frankly, if we did not have it and tried to introduce it now in the context of modern Australia, it would actually be more or less impossible to make stick." That stuck in my mind as an important factor to take into account. That is not, I think, that we should not be looking at it seriously, it has just not been a sufficient priority for us to have looked at it very hard up to now. Q51 Mr. David Clelland: If I may follow that up, in these elections people will have different voting systems. Some people will be voting on a first past-the-post basis and the European elections will be voting on a PR system. Mr Pitt: There will be. There is almost double confusion, if you like: not only do we have the local elections - and normally we have elections three years out of four, 21 wards, 63 councillors - this year, of course, it is all 63 councillors up for election. Not only is it a question of being elected, it is also the fact that the position in terms of the ballot determines their length of tenure, whether it is two, three or four years. It is undoubtedly going to be a complex election for the public to grasp. Q52 Chairman: On this question of timing, you have all the suppliers who might be interested, has the number of people who are prepared to bid for these contracts to do the stationery and printing been reduced because of the time factor? Mr Morris: Yes, Chairman. I put a notice in the European Journal about a week ago. A major company, whose name everyone round the table would recognise with whom we had had some preparatory discussions, have pulled out solely on the basis of the time and the risk to them involved in planning it at this late stage. I think I will still get bids. I have optimism that we will still be able to do the job effectively with contractors, but it is an anxiety that that factor is putting off people who you would wish to see compete. Q53 Mr. David Clelland: Are there any particular difficulties in providing delivery points for people to post their ballots rather than subscribing to the postal system? - particularly in terms of security, as some of these points will be open after office hours. Ms Mason: I think it is just a case of selecting the right delivery points. We are never going to please everybody but we will endeavour to put them in the right places and make them as central as possible within, hopefully, a ward. Q54 Mr. David Clelland: Have there been any problems in the experience of Sunderland, where you have gone through this system before? Mr Crawford: The basic paper to which we have been privy talks about "supported delivery points". In the past, some of the pilots have used simply drop-off points, and that will not be allowed this time round. Supported delivery points will be there to receive, to give assistance, and to have an area where people can mark their votes, and the votes at the end of each day will be removed. Q55 Mr. David Clelland: So it will be like a polling station basically? Mr Crawford: Yes, but on a smaller basis. 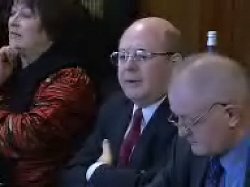 Q56 Mr. David Clelland: What are the problems around ensuring the secure delivery of ballot papers without compromising their security? Mr Morris: Chairman, we have had some discussions, including particularly, again, Mr Crawford and myself, with the Royal Mail representatives. At national level they are taking the issue very seriously and arrangements are in hand to put in place the capacity locally to do that job. I have no reason to think there will be any difficulty from the security side with the Royal Mail. After all, they handle a lot of secure material in the ordinary course of every day. I think I would echo the concerns that the two previous witnesses put to you about vulnerable points in the life of the ballot paper, so to speak, once it has left the hands of the returning officer or the original starting point, because, clearly, it is possible to see how things can go wrong. But I think we need to have a sense of proportion about this. Most of us are saying that we do not have a lot of evidence of concern or problems on the ground. There is some. We can all probably quote one or two cases. Certainly in my own authority there is potential but we have not experienced any really secure evidence on which I would say that the system is vulnerable, but I would echo the points about houses of multiple occupation. In my experience, most of the people who want to do something with an individual vote are not really into "farming" or trying to change the result of the election; they have some personal interest perhaps based on getting themselves on the register for credit reasons or other things of that sort. Their aim is less to do with the voting outcome then their personal interests. Q57 Mr. David Clelland: Is there a danger that in some areas - and I am not aware that this has ever happened, but it is possible - post boxes become full and overflowing and therefore compromise the possible security of the system? Mr Morris: These things are theoretically possible, Chairman. I am not aware that we have any particular issues with them in practice. Bear in mind that all the elections officers are pretty experienced at dealing with these things. They know roughly the turnover to expect, they plan accordingly. I am sure we all err on the side of caution and, whilst I would not say we could never be caught out, I think we are alive to the difficulties of ballot boxes which are full or particular difficulties on the day. Q82 Mr. David Clelland: That probably brings us to the question of the design and the printing of the volume of material which has to go out. The way it is designed and the way it is printed will be quite crucial in terms of security, its accessibility by disabled people, and in terms of the administration of the ballot. How do you balance these pressures? Mr Morris: We are ensuring in the pilot areas that the envelopes will be readily identifiable. They will have purple flashes on them, by agreement with the Royal Mail, so that it is clear what they are and where they are in the stream. Q83 Chairman: You can guarantee that no political party uses purple flashes as their logo, can you? Mr Morris: I am not sure that one can guarantee anything in this process, Chairman, with potentially 17 or 18 political parties, but we will have some means of readily identifying them in that sense. A lot of time has been spent on the discussion of the ballot paper, whether it should be landscape, portrait or whatever - and I think it is fair to say that that has been broadly settled now - because clearly the ballot paper is not an issue that is special particularly to the pilot areas; that is a general discussion of national significance. There is some concern about the requirement, for example, to print all the names in lists, because of the physical size, and, quite obviously, once you start going into a seriously large paper, bigger certainly than A3 or much longer than can readily be handled, then a different kind of issue arises. A lot of our assumptions about opening, bar-coding, limiting manual handling are based on techniques like window envelopes and hoping that the bar code is visible and so on and so forth. The more folding there is to do, the more likely it is quite clearly that the envelope can come back in the wrong order, even if everything is in fact there correctly. I think, in the North East, Bill Crawford's experience previously was that more of these things were there to be worried about than actually were experienced on the day. But, clearly, in an area where there has not been as much experience of these pilot areas, we are vulnerable, as witnesses said earlier, to people not properly understanding the system that we are using, so the more identifiable it is, the more plain our English can be, the more simple the instructions are able to be made, the better. But when you are into combination - and some of our colleagues are running three layers of elections on 10 June - quite clearly there is a limit to what you can do to put that across to people because different systems are running simultaneously. Q84 Mr. David Clelland: Are you satisfied there are not going to be any particular problems with all-postal voting for disabled people, for instance? Mr Pitt: All different forms of elections bring with them different disability problems. Obviously, with traditional elections there is a mobility disability issue there, and with postal ballots a sight disability, and so on. Certainly from Wakefield's point of view we will put in place whatever arrangements we can to assist people with disability difficulties to take part in democratic processes. Q85 Mr. David Clelland: On at least two occasions last year electoral officers sent back incomplete declarations of identity to individuals but held on to the ballot papers pending the return of the completed declaration. Do you think that is acceptable? Mr Crawford: We did that, Chairman, in the Sunderland pilot, and it worked very well. Q86 Mr. David Clelland: So that would be a practice to be commended, would it? Q131 Mr. David Clelland: Michael Green referred earlier to the cost of an election and had some suggestions as to how they might be financed in future, in terms of the elections coming up are local authorities having to face any particular difficulty in financing the postal ballots? Cllr Sir Jeremy Beecham: They will be more expensive in gross terms, the unit terms will fall somewhat. We are looking in a number of boroughs in Tyneside at electoral counting which will be more expensive but more efficient as well and we are prepared to run with that. I think the point that Michael has made about the costs being underwritten would be sensible. Q132 Mr. David Clelland: That is not likely to happen for these elections, is it? Cllr Sir Jeremy Beecham: Not on the face it of, no. In the North-East certainly all of the local authorities agree that we want this system and we are prepared to deal with the costs. Q133 Mr. David Clelland: Given the point made by Michael Green about what lengths some local authorities would go to to try and keep costs down is there any danger that security might be compromised? Cllr Sir Jeremy Beecham: I do not think so. I think the good practice regulations will take care of that. Q134 Mr. David Clelland: What about parish councils, how difficult will it be for them to come up with their costs? Cllr Sir Jeremy Beecham: That is another matter. It may be that the election style which he referred to will bear the cost in some cases. Mr Green: Given that the figures have been used today by previous witnesses it tends to show that the difference in costs between the traditional elections or postal elections is somewhere in the region of 10%, clearly it is sensible for those councils that consistently know they will be recharged and there will be areas where there will be postal voting to factor that in in terms of their finances? However, and can I make a point, things tie in together and you have recently had another recommendation from the Electoral Commission on the cycle of elections and it clearly should be the case that if the cycle of election proposals are to be accepted by the Deputy Prime Minister then the proposals in the central pot for the funding of elections need to be accepted in the Office of the Deputy Prime Minister at the same time. We would be slightly astonished if in the 2007 local government elections, which will be where the majority of the procedures will happen, there is cycle of elections but there is no central pot for the administration costs.